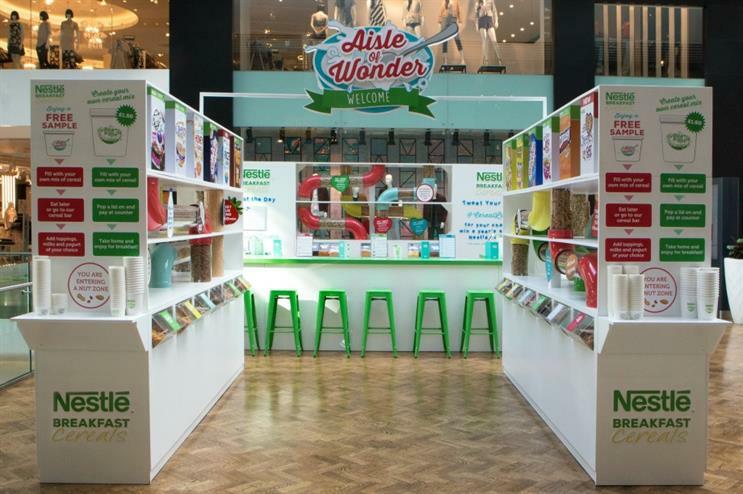 Nestlé Cereals has unveiled a cereal pop-up within Westfield Stratford, coined the Aisle of Wonder. Those who stop by the branded space are invited to choose from a selection of 12 different Nestlé cereals, such as Nesquik, Shredded Wheat, Shreddies, Cherry Bakewell Shredded Wheat, Curiously Cinnamon and Cheerios. Consumers can opt to enjoy a particular variety on its own, or opt for a personalised pick and mix creation. Individual selections can then be paired with different toppings, plus milk and yoghurt. The cereals are available to sample for free, and Nestlé is offering people the chance to purchase their personalised cereal creations from the temporary outlet. The pop-up will remain in place until 7 April, at which point it will travel to the Arndale Centre in Manchester from 9-15 April. Agency Hot Pickle created the branded space. Michelle Bull, marketing manager, Cereal Partners UK said: "The Aisle of Wonder is a fun, engaging experience that demonstrates the variety of Nestlé Breakfast Cereals and the different ways you can enjoy it for a great start to the day." Nestlé Cereals teamed up with illusionist Sean Alexander last year, to surprise commuters at Waterloo with a levitating #CerealLift stunt. Agency Tribe Marketing was behind the activity.